Janet remembers well the first time she visited Canine Partners for Life (CPL). Her employer, West Pharmaceutical Services Inc. in Exton, PA, had chosen to support CPL as one of its local charities. She and many of her colleagues arrived to “beautify” the campus, inside and out. Naturally, they were immediately attracted to the puppies and dogs in training. For Janet, that day in 2010 was a turning point in her life. It didn’t take much time before Janet was back, volunteering to cuddle with the dogs in the kennel and take them for long walks. 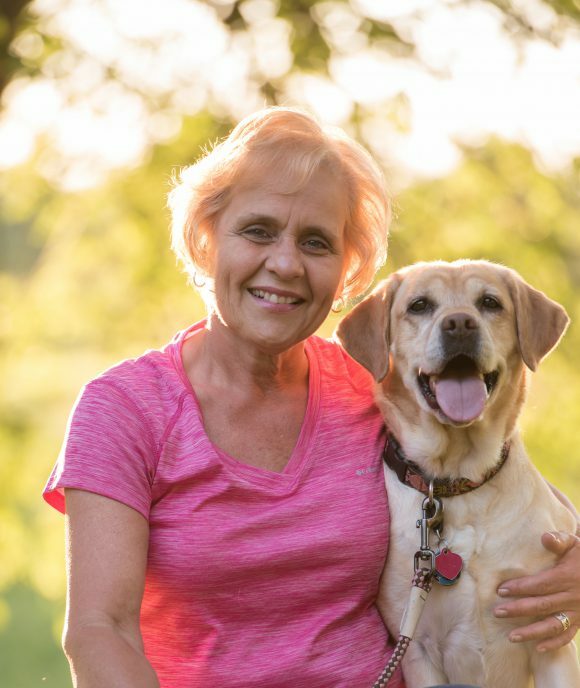 She learned to speak to community groups about CPL’s mission, educate people about service animals and describe the many ways the dogs can help their human partner. Janet fell in love with Journey, one of CPL’s breeder dogs, and brought her home to live with her. “Journey is amazing,” says Janet. “This past year, I also adopted one of her puppies, Ahvee, who was released from CPL. They’re inseparable, and they give me such joy.” She’s even created a book, Journey’s Journey, to honor this dog, who has given so much to so many people.